The birth of Jesus Christ. It’s a topic that elicits strong emotions and viewpoints. Some say it never happened and has no bearing on anyone’s life past, present, or future. Some say it’s the moment God became man and secured humankind’s destiny. Spiritual philosopher Emanuel Swedenborg says Jesus’s birth was historically and spiritually relevant on earth and in the afterlife—then and now. His perspectives are quite unique and may be unlike anything you’ve heard before about God, Jesus, and the significance of the two becoming one. In this episode of Swedenborg and Life, host Curtis Childs and featured guests review Swedenborg’s written accounts of why God had to take on a human manifestation of the Divine at the time and what it means for us now. To put this entire episode into context, we should take a look at God before Jesus came into this world. Who was God and how did he operate without a human form? Curtis reads an excerpt from Swedenborg’s Secrets of Heaven to take on that question. 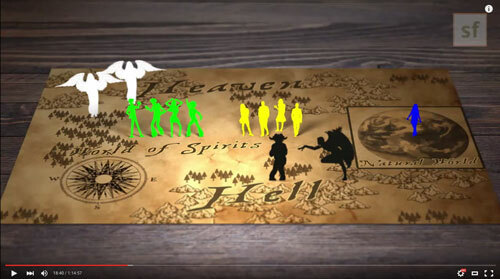 It’s a complex answer, but Curtis offers an animated explanation with diagrams to describe how God sent Divine love and wisdom through Heaven to humans before Jesus was born. As Swedenborg describes, the earliest humans were so spiritual and close to God that he was able to speak to them directly through heavenly angels in their minds. As time went on, and the human mindset began to stray from Divine love and wisdom, God needed another way to communicate. 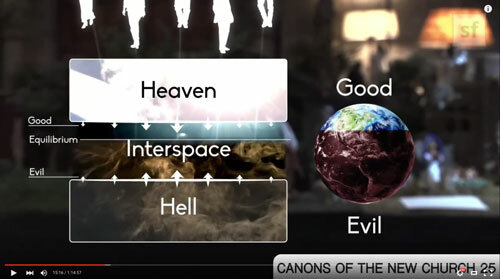 Not long before Jesus’s birth, Swedenborg describes a war between Heaven and hell in the spiritual world, which was reflected in the physical world. As hell began to threaten its dominance over Heaven, evil gained dominance over good on earth, too. Because the Divine design requires both good and evil, God cannot simply banish hell and make it disappear. But, he can maintain a balance between the two so that freewill can exist for every person to choose goodness, truth, love, and Heaven over evil, falsity, hate, and hell. 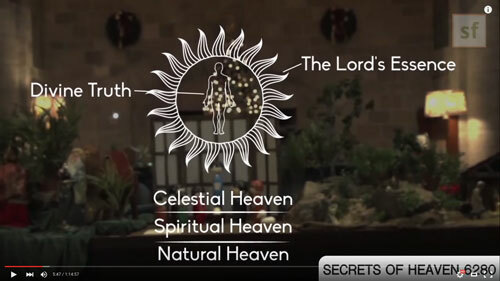 In a fascinating six-minute clip, Curtis guides us through the layout of the spiritual world right before Jesus’s birth. Because of the threat from hell and the resulting shift in the collective human mindset, God needed a new way to reach us, a new way to show us how to live in preparation for Heaven. And so, a baby was born—full of innocence, truth, goodness, and love. Curtis introduces a series of scenes from the Nativity to reflect on the power of this bold move from God. 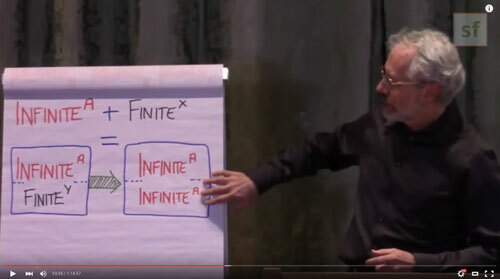 And how can the infinite become finite? For that answer, Curtis introduces Swedenborgian scholar and Series Editor of the New Century Edition Works of Emanuel Swedenborg Dr. Jonathan Rose to explain. Does Swedenborg think Jesus is the son of God or God himself? Swedenborg often talked about God and Jesus as father and son, but he strayed from most Christian doctrine on this matter. Swedenborg believes that Jesus is God himself, and not a son of God, which is explained further in this animated clip. What was the purpose of Jesus’s life? In short, he was here to unite and join the puzzle pieces that would help people choose Heaven over hell. Why did God choose to be manifested as a human which in comparison to the infinite is a weak, flawed form? Because God is goodness and love itself, becoming human was the only way he could have access to hell to fight against it. How did God become human? Simple. He followed the same Divine design we all live by. This animated excerpt from Swedenborg’s True Christianity explains the phenomena in depth. Curtis ends this segment with a final excerpt from True Christianity that perfectly sums up the results of the Lord’s coming. Swedenborg asserts that God will not come to earth in the physical form again. However, God will come again through the hearts and minds of each of us as we come to know him through the Word or Scripture. One of our past videos called The Christmas in You might help you understand Swedenborg’s unique spiritual interpretation of the Bible and God. Do you have Christmas in you? Why did Jesus say he would come on a cloud and his footsteps would be heard along with the trumpet? Does Swedenborg say anything about why Christ died on the cross? Why does it say when two or more are gathered, there is Jesus. Why can’t it just be one? Can you explain to me: when Jesus went back to himself (God the father), how did he wake himself three days later? When Jesus returned to God, was the nature between Jesus and God changed at all? Are they separated at all? We as flesh clearly have a spiritual advantage. Can you tell me what my most powerful weapon to fight and work for God is? Did Swedenborg ever talk about the Quran? Jesus balanced the pull between Heaven and hell, and before him the world was in a time of distress. Will there ever be a time Heaven will have a greater pull on spirits? Does Swedenborg say anything about the Magi or Wisemen and the Star? Some say Jesus wasn’t a person, and that we have Christ consciousness when born. What would you say to that? If hell was threatening the existence of humanity at the time before Jesus was born, how about the present times?